Athleticwear giant Adidas and vegan fashion designer Stella McCartney have launched a new addition to their collaborative range. For the first time in this partnership’s history, the classic Stan Smith sneaker is now made from vegan leather. The move is in line with Adidas’s recent announcement that it would be shifting its source materials to renewable resources including an emphasis on plastic destined for or salvaged from the world’s oceans. The athleticwear line has already launched a shoe made from ocean plastic in an effort to both draw attention to ocean plastic pollution and decrease its reliance on any virgin plastic products. In addition to the shift to its designs, Adidas announced it would also be moving away from virgin-sourced and single-use plastic in its offices and warehouses worldwide. McCartney is a logical choice for the sustainable footwear design. Her designs center not just on sustainable and renewable resources, but emphasize cruelty-free choices as well. The designer won’t work with leather or fur and has dedicated resources toward developing cruelty-free alternatives to wool and silk. She most recently designed a wedding reception gown for the new Duchess of Sussex Meghan Markle, and fellow footwear and fashion mogul Miley Cyrus stunned the Met Gala in a vegan satin silk McCartney gown. The new design maintains the sneaker’s clean, white look. Stan Smith’s face juxtaposes with Stella McCartney’s on the tongue. The heel features a burgundy and blue stripe and Adidas’s Three Stripe branding is replaced in this configuration with a star pattern. The shoes are now available for pre-order on the Stella McCartney website and retail for $300. The new shoe comes just days after Adidas announced the launch of a book in honor of the iconic Stan Smith sneaker. The shoe was originally called the Haillet when it launched in the early ’70s. Adidas approached American tennis player Stan Smith to endorse the show that became an iconic piece of footwear not solely reserved for athletes as the Stella McCartney collaboration emphasizes. The shoe has seen a number of collaborations over the years with artists and designers, including Colette, Yohji Yamamoto, Raf Simons, Pharrell Williams and more. 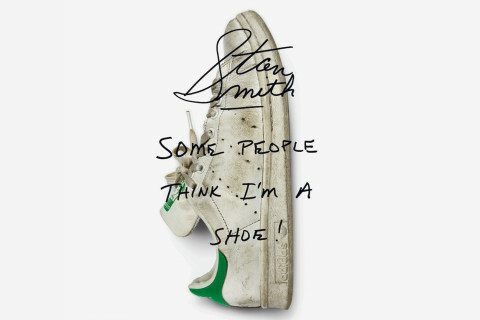 The new book, “Stan Smith: Some People Think I’m a Shoe,” is available at Adidas stores nationwide. Designer Stella McCartney and athleticwear brand Adidas have partnered on a vegan leather version of the iconic white leather Stan Smith shoe.